Mo and Brittany have been together for over 12 years and are happily married. They have 2 beautiful children, Ari and Ella. Mo has suffered from Crohn’s disease for over 20 years, and was diagnosed when he was 11. He spent his youth struggling with the disease, often feeling isolated from his family and friends. He wished there was more support and awareness, specially for youth, in his community. Mo and Brittany decided to address this need and founded the Nanaimo chapter of Crohn’s and Colitis Canada over 10 years ago. They wanted to make a difference in the lives of everyone who suffered from IBD, to bring them together and create a community full of support, while raising awareness and funds for research. Mo and Brittany are overcome with joy when reflecting on the growth of the chapter, and the positive impact it has had on so many lives. The chapter has raised over $150,000 to date for research towards a cure. 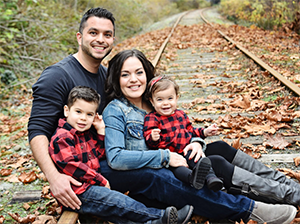 They continue their involvement and volunteerism with the chapter and are looking forward to celebrating the 10th annual Gutsy Walk in Nanaimo this year!